The last week has brought a flurry of reports and rumours over the new JJ Abrams Star Trek remake, exciting and disgusting Trekkies everywhere. Although I’m not very confident this film will actually work, the amount of info leaking out of the set is worth reporting. You’d almost think it was deliberately orchestrated this way and knowing Abrams, it most probably is. Thin, regal talent who have BROWN or BLACK hair AND are OK with their eyebrows being shaved from the arch outward to portray a “Vulcan type” eyebrow shape. Especially seeking talent with interesting and unique facial features, such as: long necks, small heads, extremely large heads, wide-set eyes, bug eyes, close-set eyes, large forehead, short upper lip, pronounced cheekbones, over or under sized ears and/or nose, facial deformities, ultra plain looking people, ultra perfect looking people, pure wholesome looks, twins, triplets, emaciated talent in addition to regally poised and postured talent. Eh, so you have to look weird or completely perfect? By the way, I’ve never heard a casting call before looking for “emaciated talent”; they want people that are freakishly skinny? Or does “emaciated talent” mean “not that much talent”? Next up, is the report that the role of Captain Pike has gone to Bruce Greenwood, an actor that has been in a LOT of movies, but in normal unmemorable roles. You know what I mean, right? It’s one of those guys that always plays the father figure or the senator/president or the husband, those roles that are needed in the movie, but won’t really impress anyone. This only strengthens my idea that Captain Pike will have a very limited part in the movie. Now the rest of the news is at the moment still a bit fuzzy. For starters, Rachel Nichols, former Alias wannabe, has reported that she’s been cast in the remake, but doesn’t even know who her character is. IESB received photos from the set (mostly extras outside of a warehouse studio covered up in parkas, nothing all too interesting), and one of the photos shows an actress who looks a lot like House star Jennifer Morrison. 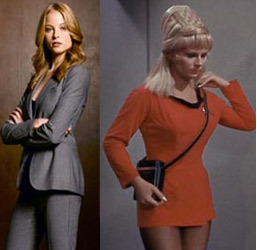 Is this Morrison (see IESB’s photo above), and if so, is she the new Janice Rand? We’re waiting on a confirmation. Hmm, the photo does look a lot like her and we know that she now has blond hair in House. Last but not least, comes the report that Winona Ryder will play Amanda Grayson, Spock’s human mother. But exactly what does this mean for the plot? i can’t believe that they would cast an actress for the mother almost just as old as the son. It somehow seems to me that there will be even more time travel in it then we originally thought, what with Leonard Nimoy also being cast Spock. My idea is that Spock travels at least twice back into the past, once when he’s a kid and once when he’s just graduated from the Academy. Or will it just be boring flashbacks? Either way, wanna bet they’re going to cast a young Spock now?